A PowerPoint designed to introduce key phrases and vocabulary for this topic using scrambled sentence activities and a memory game. 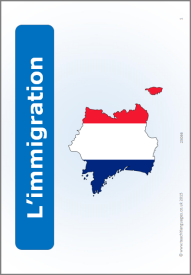 You could also use the reading resource L'immigration: lecture and the discussion questions A2 speaking practice: immigration as a follow on to this. Excellent starter for this topic. Thank you so much. So good to have these starters, especially the powerpoint. Excellent starter for this topic. Thank you !